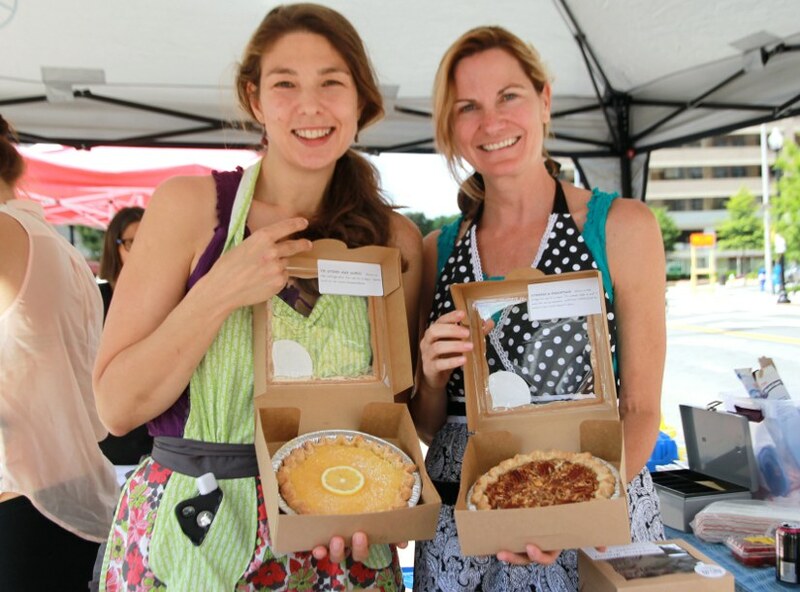 They first began operating in October, and now have their own booth at the Wednesday Farmers Market in Clarendon. The two, who have children attending the same school, met while working at a PTA bake sale a year and a half ago. 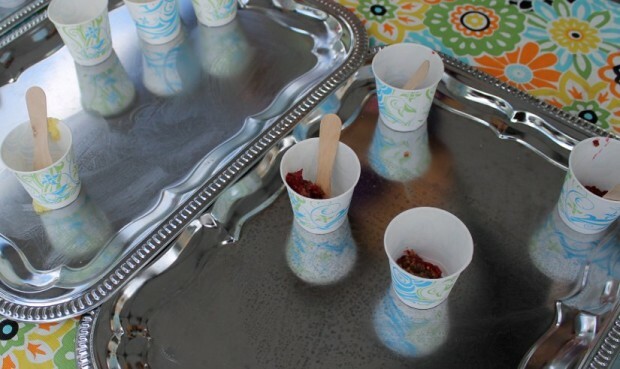 After months of learning about regulations and starting a business in the area, they began testing their original recipes. To keep in line with health codes, Sheire and Haskvitz use the kitchen at the Unitarian Universalist Church of Arlington. They bake on Fridays and invite neighbors over for pie tastings. They’ll make several versions of the same type of pie with just one thing changed to get input on what tastes best. The women change their menu often based on what’s in season. In the fall, apple caramel pies were a big hit, and now berries are a summer favorite. They also use locally sourced ingredients, and no additives or preservatives. 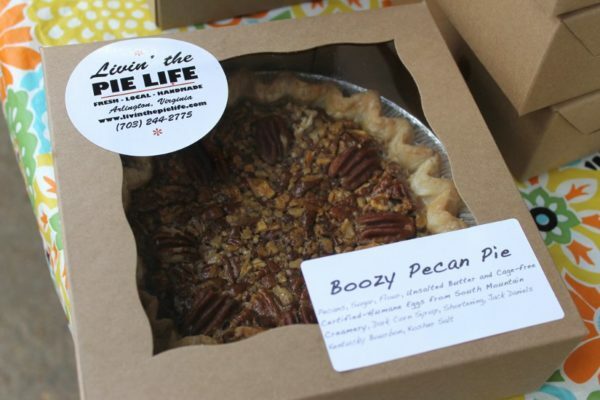 Not all of the offerings are sweet concoctions like the pecan pie and margarita pie. Customers have also been digging into savory pies like tomato basil or macaroni and cheese. Haskvitz contends that the pies blow cupcakes out of the water. 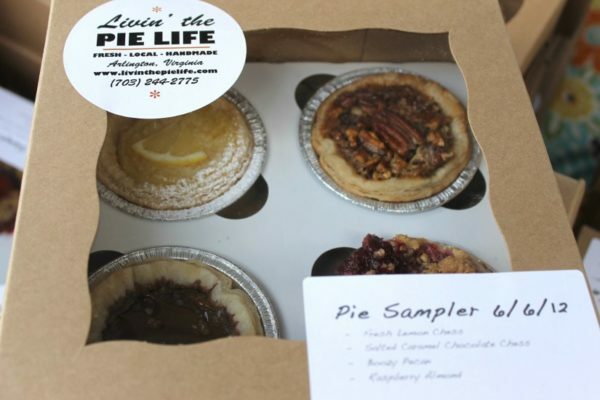 On Fridays, the duo deliver the freshly made pies to the homes of customers who ordered online. They arrive dressed up in 1950s garb to add to the business’ nostalgic, family vibe. Contributing to the nostalgia is the practice of giving a $1 credit to anyone who returns a pie tin from the larger pies ordered online. Those tins are then reused, as they often were in decades past. The tins for the smaller pies sold at the farmers market are recyclable, as is the rest of the packaging. Although they’ve thrown around the idea of starting a food truck, they’re not interested in a brick and mortar location. Right now, they’d like to keep a focus on convenience. Although they’ve only been in business for a few months, the women have been accruing regular customers. Both say they’re proud of their products.